Wherein I return to serious basketball games. Tody is a day of rest in honor of tonight's NCAA Basketball Final Four game: Louisville Cardinals v. Kentucky Wildcats. Obviously, I am a Cards fan. I remember crying as a kid in Freedom Hall when Pervis Ellison hurt his knee. This is serious, folks. Now if I can only stay awake.... stupid GMT! Sunshine, picnics, and talk of the weather. It's a known fact that British folk like to talk about the weather. This was confirmed by my recent and English tourmate, as comments about the weather were surely the most consistent topic broached in the long car rides. Granted, folks in the UK are not the only people to talk about the weather (it's an easy topic and an admitted "social prop," after all), and there's good reason for the tendency: the weather here changes constantly. Still, the most common weather conversation since I've moved to this island has been, "Ooooh, sorry about the weather. How are you handling it?" I'm pretty sure that most folks over here think all of America is like Miami. Quite the contrary, I didn't even bother to bring more than a fall jacket with me on the move here. There's no need for a down coat when it's only 30*F outside. Inverleith Park, Edinburgh. A picnic in a chilly 70*. St. Giles Cathedral, Royal Mile, Edinburgh, Scotland. Not a cloud in the sky. Follow this blog on Bloglovin', an easy way to follow your favorite blogs in one place. UK Tour -- finally over. Ah, finally back in Edinburgh. We were only here for a couple of days (to play a show), then headed north. The last five dates of the UK Tour went well, but I was unable to find wifi for more than three minutes at a time. 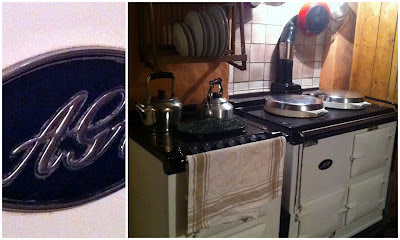 Somehow almost a week passed, and I haven't blogged -- unacceptable and my apologies. 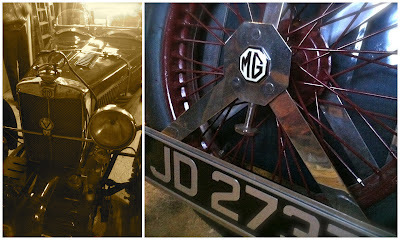 Yesterday we woke up in Gartly in Aberdeenshire (I think) and headed back to Edinburgh. Well, Kirsty was heading all the way back to Manchester, but she slowed down enough to allow me out of the car in Edinburgh. I couldn't be happier. The tour was great fun, and I met some just wonderful people along the way (my favorite thing about touring!). Still, I'm exhausted. It was one of the most mentally stressful tours I've had since my days playing with Days of the New, and I'm ready to clear my head. I love touring, but it's not the glory and glamor you're probably imagining. Thanks to Kirsty's insistence, however, I only slept on the floor once the entire tour. Pretty good, don't you think? Let's talk about driving for a minute, shall we? Road trips back home are day or week-long events. Road trips here are anything over an hour. I know America is just HUGE. But tell someone in the UK you're heading somewhere over three hours away, and they ask you where you're stopping over for the night. Kirsty was a trooper and managed to drive from Aberdeenshire to Manchester yesterday. I'm pretty sure she'll be questioned by the UK authorities for proof of citizenship now. And all you doubters? The sun is still shining in Scotland, and it's a glorious 68 degrees. Take that! It's always sunny in Stockbridge. Ah, Edinburgh, how nice it is to see you again. I adore traveling, but Edinburgh remains just about my favorite city in the world. The dark stone buildings, the winding cobblestone streets, the friendly neighborhoods ... the castle! Also good news: I didn't have to climb a single stair to take a nap. David moved flats all by his lonesome while I was gone, and we were reunited in a cute little fairy tale abode. No thatched roof, but plenty of gardens and characters, as I found while I wandered the streets this afternoon in the glorious sunshine. It's always sunny in Scotland, no matter what you've heard. Street view ... Stockbridge Colonies. Edinburgh, Scotland. Our front yard ... no garden-sharing, just ours! Hope everyone's having a glorious week. Louisvillians, enjoy the heat. I don't think I'll feel 90 degrees over here unless I'm in a hot tub. Tour update: Lake District and Jeopardy! We played in a barn last night. Well, it was an old stone barn that's since been converted into event space and classrooms at the historic Nab Cottage on Rydal Lake. The Lake District is as pretty as I'd heard it was. It's pretty much some big hills with lots of lakes. Lakes are a lot like lochs, only in England. English things are a little more tame than Scottish things, so the wilderness was polite and forgiving there. There was also lots of talk about the weather. The show was good fun, and I learned an important cultural difference: no one over here has ever heard of Jeopardy!™. This is based on my small sample size of about forty natives, but not one had heard of the show, the concept, Alex Trebek's mustache, or Merv Griffin's theme song, thus ruining my witty stage banter. I used to be in shock of what British folks had heard of -- like Hershey bars, The Cosby Show, and loads of terrible American television programmes. But they don't get the popular quiz show that first debuted 48 years ago (on March 30, 1964, interesting factoid!)?! What confuses me is how often Jeopardy! comes up in other pop culture references. I mean, did no one in Britain see Rainman? "Practically 26 minutes to Jeopardy!" I know at some point in the past, Saturday Night Live aired in the UK. Did they cut out the "Celebrity Jeopardy!" sketches or did British audiences just not think they were funny (perhaps hence why it doesn't run anymore over here)? Now I'm on a research kick to recall all international film pop culture references to Jeopardy!. Hmmmmm ... White Men Can't Jump, Groundhog Day, The Bucket List... what else? Sorry, I know I should be equally surprised that Americans don't know what Marmite is, but this Jeopardy! thing is just really upsetting. Tour update: deep thoughts on a welcome day off. I'm not used to having St. Patrick's Day off-work. I'm used to scrambling to memorize a bunch of Irish drinking songs that I learn once a year and grabbing a utility player to noodle and sing along. Last night I was in bed writing by 9pm, while the world around me got drunk. Kirsty's music doesn't exactly fit the bill of a night of raucous drinking, so she, wisely, didn't bother looking for a gig on St. Patrick's night. Seeing as our routing took us through Manchester, we just decided to stay the night at Kirsty's flat. It was nice to have a day off where I wasn't a guest in a stranger's home (though I think Kirsty's angry with me for asking her to stop treating me like a guest here -- but, hey, she deserves a day off too). Besides sightseeing, my favorite thing about touring is meeting all the wonderful people from all over the world, but, whew, is it tiring! Staying with hosts is a great way to hear about the local area and see how people actually live (yes, they do drink tea at every occasion! ), but after over two weeks of it, I'm peopled out. If you know me, you're probably shocked at the prospect, but it's true. A chatty person by nature, I also love hearing other people's stories and asking a million questions about their lives. So when the conversation begins at 1am after we've come home from the gig, there's no bedtime in sight. Last night I was so thankful to be able to lie down with a book at 8:00 and sleep whenever my eyes nodded off. No cups of tea to politely accept, no fascinating family stories to tempt me, no new gardens or bookshelves to explore ... just time to completely wind down. Peaceful English garden in Cornwall. Tour update: Cornwall -- Differential Calculus and Beings Animalculus. Sadly, for me, the town itself wasn't anything spectacular, and we didn't see a single pirate. In fact, we didn't even stop the car. I drove through with my eyes peeled for Linda Rondstadt and Kevin Kline. I did see a few old women who may have been Angela Lansbury, but we drove on towards Land's End too quickly for me to question them. Still, it was really cool to have been there. We did eventually stop in St. Ives (pictured left), a town with less grit and more polish (and more tourists) just a couple of miles down the road. I took loads of photos of the sea, enjoyed a saunter through the adorable narrow streets, and found some delicious chips at a fish-n-chips shop on the boardwalk. Good fun. During our drive, we also visited some ancient stones on the way to Land's End. To your right is a photo of Lanyon Quoit, one of those megalithic tomb thingies from a few thousand years ago. I like olde stones, but since reading Outlander, have been worried about getting to close and being sucked back in time. One can never be too careful. a visit to St. Michael's Mount -- a castle, on a hill, on an island, that is only an island when the tide is high. The tide was low, so we were able to walk along the sand to have a closer look. The castle itself was closed (just like most thing in England seem to be), but the view was still spectacular. St. Michael's mount later that day ... high tide. Update: On international moves, flats, and good luck! I know I've got some blog readers out there who roll their eyes when reading about our good fortune ... those of you who get upset when I get good luck should probably just stop reading now. David and I are moving to a new apartment, and I'm pretty sure it's legitimately part of a fairy tale. 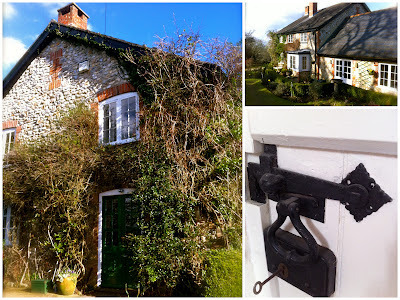 I've always loved browsing property websites and peering into windows on streets I adore. There's a particular area of Stockbridge I've been walking past for months because it's just so cute. Oddly, "To Let" signs just never appear. I got the feeling you had to know someone in order to live there, but we have been offered a flat in just those buildings: the Stockbridge Colonies. They are positively magical, and I am so excited to be returning to Edinburgh to our new place (even though I'm loaded with guilt that David has to do all the moving). I love being on the road, but I sure do miss David. The poor guy has been home by himself, foraging in the pantry. It's not because he can't cook without me (he's actually a much better and more creative cook than I am), but it's that when your'e moving (especially when you are moving by yourself because your partner is off frolicking about castles), it's best to not move boxes and boxes of food jars. I'm pretty sure David's living off couscous, pasta, and mysterious freezer contents. Our original plan had been to move to Paris in April while David did an exchange semester. Over the past few months, we decided that would be too much of an ordeal. We love Edinburgh and don't feel like apartment-hunting in another language, sorting out new visas, health care, and two more international moves. I'm pretty excited about our new place, with its gardens and community events and proximity to everything we love about Stockbridge. Tour update: Bath and a spa date. We played Bath, England, about a week ago. For those not familiar, it's a city about 100 miles west of London, that was established by the Romans almost 2000 years ago. The city looks unlike any other in Britain, reminding me more of Italy than England. Most buildings are made of Bath stone, a light honey-colored stone that gives off a friendly glow. It's a beautiful city. Probably the most attractive thing about the area to the Romans was the natural hot spring -- or rather, hot springs. 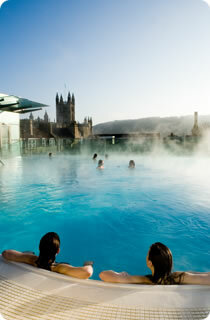 The only geothermal hot springs in Britain, the water actually has to be cooled down before the public can sit in it. It's that hot. This time Kirsty had the genius idea of a day at the Bath Thermae Spa. Go ahead, click on that link and daydream for a few minutes, then I'll tell you how great it was. We bought a two-hour voucher and somehow justified the expense as necessary meditation and relaxation from being crunched in a car for hours each day. Well, I didn't really need justification. Stuff like that is once-in-a-lifetime. No photography was allowed, so the image to your right is from the Spa's website. This particular pool was my favorite, as it was on the roof. The weather was glorious, blue-skied, and sun-filled, despite being only around 50 degrees in the air. That didn't matter because I was mostly covered by 94* water, chasing and avoiding the bubbles. It was £26 for a two-hour session and worth every penny. The opposite of being in a car for a long trip, being loose in a large pool is free and relaxing. Kirsty went back and forth between two baths and a steam room, while I spent most of my time on the rooftop. It's hard to beat a view of an ancient Abbey, rolling hills, steeples, and gorgeous architecture. Two more castles -- King Arthur and Cadbury Eggs. Yes, yes, our gigs have been great, but let's talk castles! The first week passed uneventfully in the world of castle collecting -- sad to see those brown road signs fly by without time for even a photo. Saturday in Falmouth we had most of the day to ourselves, as we didn't have a long drive to the gig. Taking alone time is super-important when you're on the road with another person, particularly when both people touring are only children, ergo used to having a bit of space. While Kirsty opted for a walk on the beach (which I'm sure was lovely), I needed a walk through the city. Beaches are nice, but when choosing a vacation, I always choose city over beach. I love getting to know a new place, seeing the people, the architecture, the cafes, and the cobblestones. Falmouth was a good town for that. Of course, one Google search later, I discovered there was a castle built by none other than Henry VIII (picture him laying stones and mortar while eating a chicken leg and playing the lyre -- what a talent! 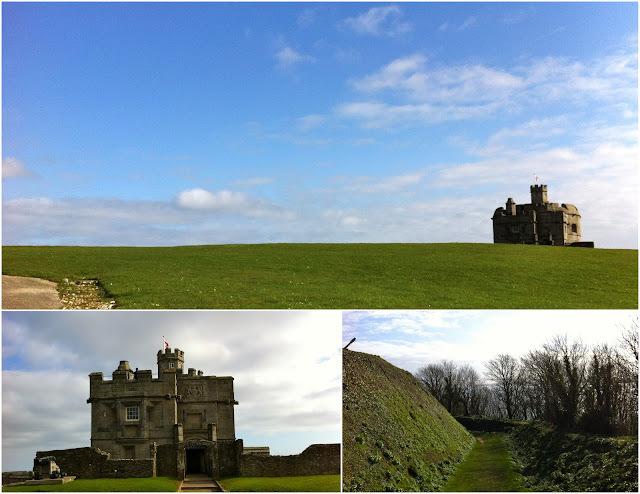 ): Pendennis Castle. I was a bit concerned that Pendennis Castle might be a bit stuffy like the Pendennis Club (a Louisville institution where the Old Fashioned cocktail was invented, you're welcome for that bit of trivia). Historically, that club hasn't been a deep sympathizer of minorities (historically, folks, not present-day! ), so I didn't mention my half-blood condition when I bought my admission ticket to the Castle. You know, just in case. I was able to use my Historic Scotland membership card for half-price entry, yet again proving its value. By the time I hiked to the top of the hill -- castles are always on a hill -- I was ready for a cup of tea in the warm Cornwall sunshine. Glorious. There was a wide green lawn, squint-worthy sunbeams, a cup of tea, a Cadbury egg ('tis the season), and a castle! 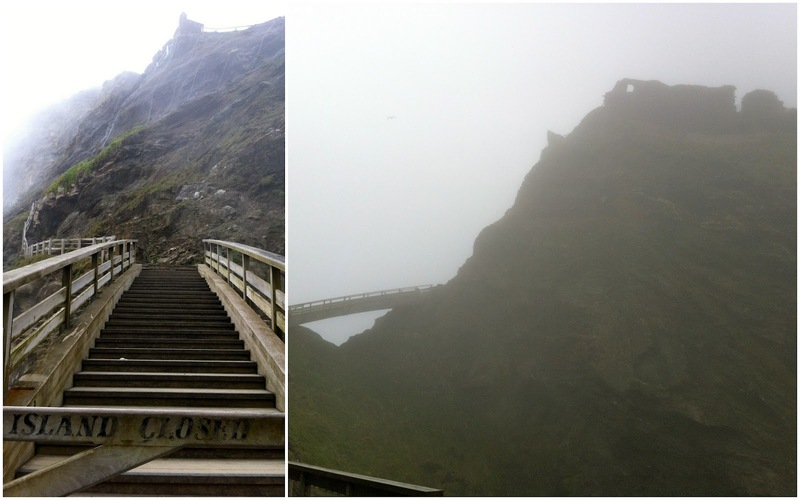 A few days later, during the drive from Penzance to Glastonbury, we took a detour down some mysterious roads to Tintagel Castle on the north coast of Cornwall. Tintagel is the legendary birthplace of King Arthur, and whatever truth there is (there's always some truth to legend) certainly made itself known. The ruins of the castle itself are on a small cliff of an island, accessed only by steep wooden and stone stairs. Just getting to the stairs requires a hearty hike, but we were up for the task. Of course, the island/castle was closed (because that seems to be how things are going this tour), but the views were spectacular. 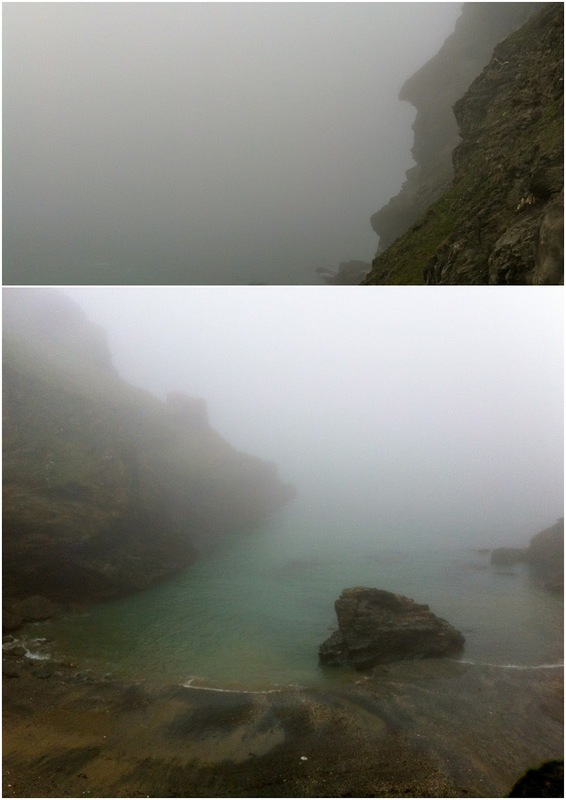 The mist rose and fell as if by magic, and the castle walls passed through them as they came and went. There are loads more adventures to record, but my wifi time is always so limited on tour. Maybe it's time to write that book. Tour update: Castle Collection, Abbey Road, and Wallyworld. I know y'all think all I do is visit castles and sleep late, but I swear it's not so glamourous. There's not much fun in reading blogs about tour books, load-in times, and arguing with the GPS, so I tend to write about the sidetrips when on tour. We haven't had very many this time 'round, mostly because of tour books, load-in times, and arguing with the GPS. But we have managed to squeeze in a few sites here and there, at least stopping quickly for a photo. Kirsty and I have seen loads of those brown roadside signs that indicate tourist attractions. The first one we followed seemed promising: the "Historic Market Town" of Retford, England. Folks, do not believe "Historic Market Town" has anything to do with Current Market Town. There had indeed appeared to be a market, which was closed, and none of the locals we met could think of a single tourist attraction to visit. I did manage to score a cupcake, though, so not all was lost. We've been a bit more wary of the brown road signs now. Today I was really excited about visiting the Eden Project, a nerdy ecological series of biomes that would be heaven to a botany-lover like me. After hours and hours of driving, it was closed. Just like Wallyworld. I figured I'd go ahead an post some other fun posts from our adventures. Most places we've just run long enough to snap a photo, but a blog photo lasts forever, right? Somewhere in Wales. There are always rainbows in Wales. Sometimes even a DOUBLE RAINBOW!! A quick walk through what's left of the original medieval Sherwood Forest led us to Major Oak. Any tree with a name is clearly important. This one is thought to be around 1,150 years old. It's maybe half the height of the oaks on Cherokee Road in Louisville, but the trunk is maybe six times the width. The branches are supported by wooden beams, and you can't walk up to it anymore. But it's still a mighty tree. Robin Hood (pictured below) hid out in nearby oaks. 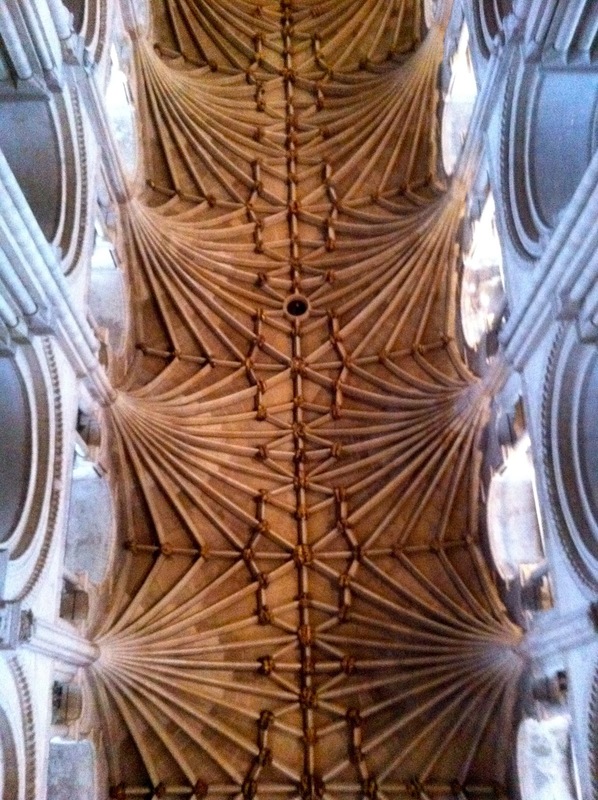 Ceiling at Norwich Cathedral. Norwich, England. Good looking, rather stark cathedral. I am still blown away by the feats of engineering from a thousand years ago. 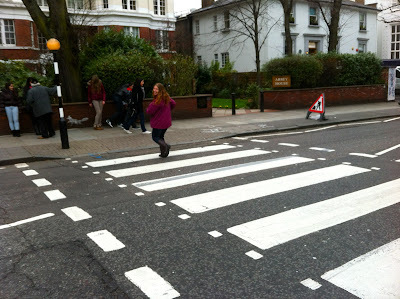 Obligatory Abbey Road photo, London (St. John's Wood), England. Thanks to Owen and Chris for taking me there. I'm sure you've seen it a gajillion times, but I was pretty excited about it. I'll take you to Graceland someday. 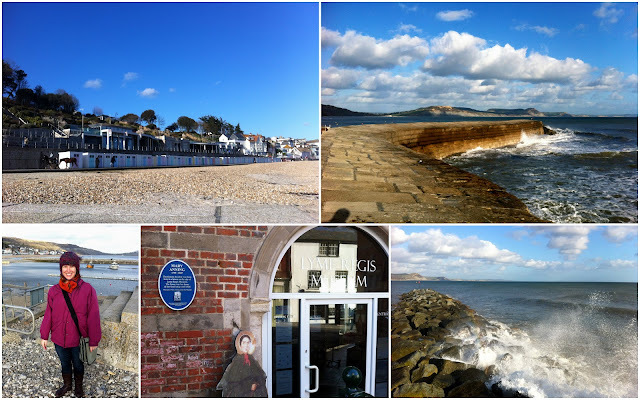 We also had a great day out in Lyme Regis, which you can read about on yesterday's blog. Like this blog? Follow The Red Accordion Diaries on Bloglovin', so you don't have to check back daily for updates. Tour update: AGAs, MGs, and Lyme Regis. I sometimes have a hard time differentiating between novels and reality. Part of that is, I think, that novels contain so much truth. I'm not being philosophical and talking about subtext and themes, but more the serious amount of research that goes into keeping a novel historically accurate -- whether it takes place in 2008 or 1808. It's been a good music tour so far, but I haven't managed to be the tourist I usually am while on the road. Yesterday was really nice though ... getting a lovely stroll on the beach in Lyme Regis and fossil-hunting on the beach. Hoping to have more sights to post this week. Tour update: Nottingham, Norwich, and London Town. As usual, wifi on the road here in the UK has been tough to find. It's time like these when I really miss my iPhone. I've got it, of course, but it only works on wifi. Sigh, how I love technology. Enough namedropping. We've had a string of great shows, and I'm a little sad we have a day off today. Our hosts in London have been amazing, and the house concert we played last night was so fun. It was completely acoustic, and the crowd sat politely engaged just a few feet away in the living room (or "lounge" as they say over here). Kirsty sounded beautiful as always, and I offered up court jester antics, as always. It's a nice balance and a good show. 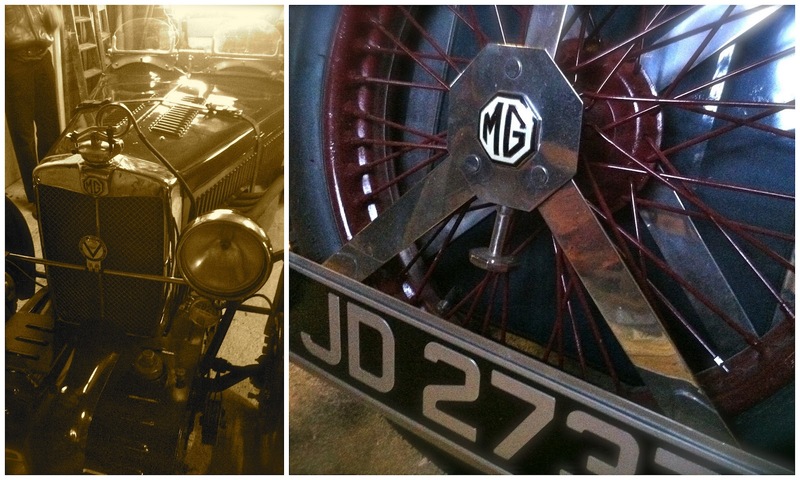 In the past few days, we've spent time in the original medieval Sherwood Forest, Norwich Cathedral, and in the car. I haven't yet been to a castle, but perhaps that's what days off are for. But first, I'm off for the obligatory Abbey Road photo. Check back when my laptop has fast enough wifi to load photos. Off to the south coast today... some pub that's supposed to be the greatest pub in the world. The Skull & Compass, or Compass & Hat or something. I'll get it right tomorrow. Fingers crossed that there is wifi. Day One - North Wales: Rabbits and Royals. On the road! I love that feeling. Emails and voicemails seem less important (sorry to those who have written or called), and I remember that I am at work. We set off from Manchester around noon and headed to Wales. The border is only about 45 miles from Manchester city centre, but once you cross over, you lose all vowels. It's fntstc. We had enough sunshine and daylight before load-in to drive a bit past Bangor, where our show was, onto the island of Anglesey, which my autocorrect thinks is Anglesby (sorry to the locals), where Will & Kate live. After taking plenty of photos at the train station in the town of Llanfairpwllgwyngyllgogerychwyrndrobwllllantysiliogogogoch, we headed to see a bit more of the island and to look for Prince William's house take a stroll through some pretty farmland. I think technically we were hunting for rabbit warrens or something, but all I could see was big farmhouses where Kate & Will probably live. Unfortunately, it was time to leave before we found either rabbits or royals. The gig was great fun, and the cafe where we played was delightful -- delicious food (vegetarian shepherd's pie) and a packed house that sat politely quiet during our show, laughing at he right places, and listening intently. I met some lovely Welsh folks and had a genuine good time. Our host family lives in the village of Penmaenmawr, which sits at the foothills of Snowdonia a short distance from the sea. From the front door of the gorgeous Victorian mansion where we stayed last night, I can see the mountains and the sea as well as majestic pine trees. It's truly idyllic here, and I'm a bit sad to be leaving Wales. Every time I've been here, I've had a grand adventure. Still no dragons though... off to Nottingham this afternoon. Several people have mentioned Lupe Pintos since I first blogged about missing chocolate chips, back in the fall. I don't know why it's taken me six months and a personal chaperone (thanks, Fiona!) to get there. It's probably because it's on the south side of town, and I live on the North side. Once I gave up my bus pass, I stopped traveling further south than the Castle. Stockbridge is idyllic, and it's easy to get sucked into village life. 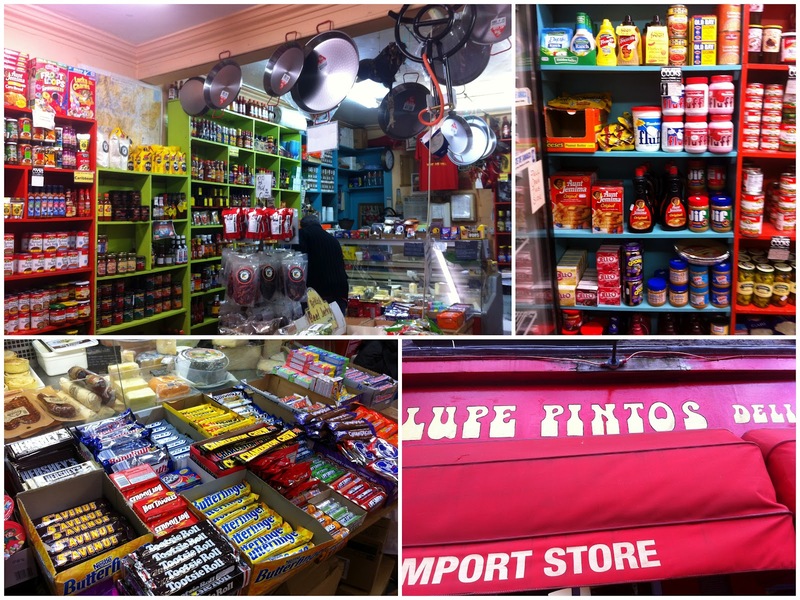 To be honest, many of those products that made us homesick are unnecessary time-savers. Like Aunt Jemima pancake mix -- you know, for when you can't be bothered to mix a little flour, water, milk, and baking powder together. I mean, of all things to make from scratch, pancakes have got to be among the easiest. Even chocolate chips (they had Nestle TollHouse Chocolate Chips!!) seem kind of like pre-chopped chocolate for lazy Americans (like me). Although, to be fair, it's the only semi-sweet chocolate I've seen over here, and sometimes dark chocolate doesn't cut it in cookies. This little store -- about 1/8 the size of a New York corner deli -- was packed with specialty imports from various countries, but the owner sure did order the right things and name brands to make American ex-pats oooh and ahhh. A quick list: proper tortillas, tortilla chips, ranch dressing, jell-o, Jif peanut butter, Hershey's chocolate syrup, Hershey's chocolate bars, reese's cups, Libby's canned pumpkin, French's mustard, Ro-tel (but no velveeta), Butterfingers, and A&W root beer. The Lone Star beer stole David's heart. 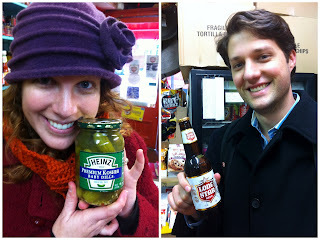 I swooned for the Kosher dill pickles. 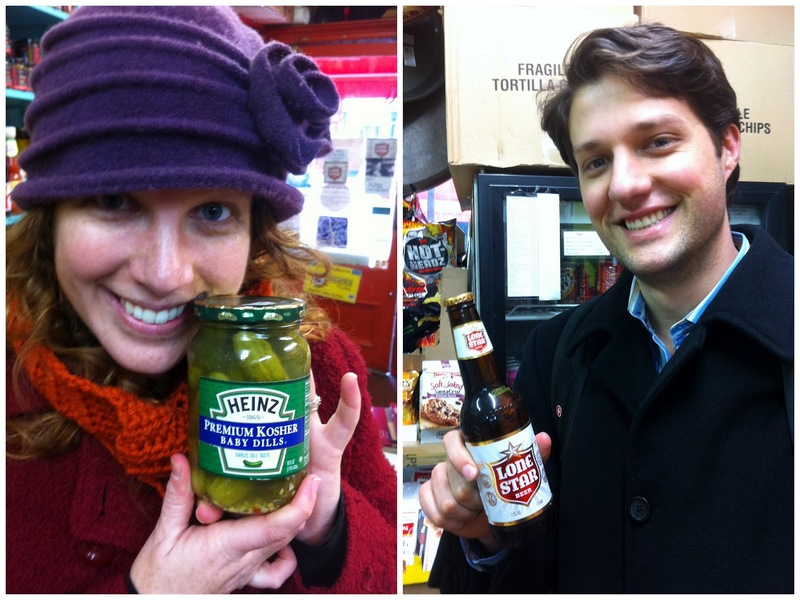 Anyway, I'm pretty sure Fiona got some kickbacks for bringing two homesick Americans into the store. We walked away with a couple of Lone Stars and some sriracha sauce, but now we know where to go when David runs out of Hidden Valley.